Tension headaches, cluster headaches and migraines can be debilitating. Depending on the type, headaches may be characterized by a dull throbbing all over the head, a piercing pain behind the eyes, or an intense throbbing accompanied by nausea and visual disturbances. Most people experience this malady at one time or another, but those that suffer chronic headaches (occurring 3-5 times a week) should look at the quality of their current sleep set up. The wrong mattress (or pillow, for that matter) can affect much more than the restfulness of your slumber. A less-than-ideal set up can affect your health in many ways. And while most people think of low back pain, stiff joints or allergies from chemical additives or dust mites, a poor mattress or unsupportive pillow can also cause headaches. We all appreciate the importance of a mattress that feels comfortable – a sleep surface that is conducive to a good night’s rest. But having the right pillow and mattress can also make a huge difference when it comes to headache prevention. 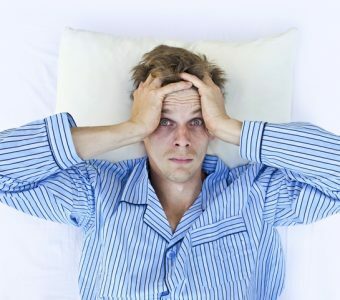 Research has long shown that poor quality, disruptive sleep can worsen health conditions. The alignment of your cervical spine plays a large role in how well you sleep. Sleeping on an old, flat pillow, or one that is too high and large, can be a recipe for disaster. If you wake up with a crick in your neck and tension headaches, your pillow may well be the culprit. Pillows should be replaced – at the very minimum – every three years. Regardless if the pillow is made of memory foam, polyester or latex, the material will eventually begin to break down and compress. A good pillow should create a neutral alignment between the head and the body. Goose down pillows, while super comfy, lose their shape almost immediately and offer very little cervical support. Look for a pillow that keeps the cervical spine of the neck in proper position. We spend more than a third of our lives sleeping, but few of us place adequate attention on the quality of our mattress, and our health can suffer as a result. Migraines and poor slumber have a complex connection that is still not fully understood. Research has shown that interrupted sleep can trigger migraine headaches, but exactly why this happens is still a mystery. What experts can agree on is the importance of deep, restful sleep. The long-term consequences of poor quality sleep have been well documented. From memory problems and weakened immune systems, there are severe side effects of sleeping on an old, uncomfortable mattress, and headaches are one of many. A bed that’s too mushy, too rigid, or not supportive enough can seriously hamper the quality of your sleep, leading to extra tension, stress and headache frequency. Mattresses have a limited lifespan, and should be replaced every 5-8 years. If you see noticeable valleys, or springs that have sprung, it might be time to purchase a new mattress. An aching noggin may also be tied to the off-gassing of chemical odors from mattress materials. Many of today’s memory foam mattresses, made of a polyurethane foam, have flame retardants and compounds that can produce a noticeable odor for the first couple of weeks. There are strict safety regulations on U.S.-manufactured mattresses, ensuring no imminent health risks, but some individuals are especially sensitive to chemical odors and can develop allergies and headaches. A smarter choice in this case is a bed made with natural materials, such as an organic latex mattress or one filled with organic wool or cotton. If you are suffering from chronic headaches and think your pillow or mattress might be the culprit, we invite you to stop by your nearest MattressWorld Northwest. We are Oregon’s largest mattress retailer and have the best prices and selection. Be sure to take advantage of our smashing holiday sale, and enjoy huge discounts on select models until December 31!